Welcome back, colleagues, followers, friends, and awesome readers! 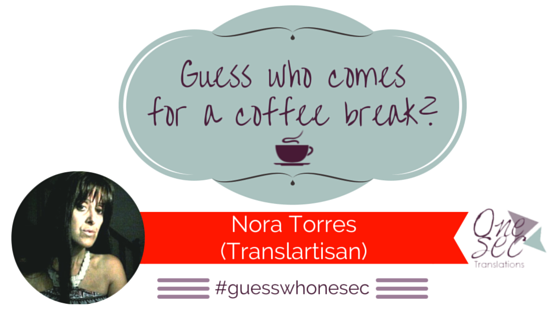 Nora is here with me and she’s sipping her caffe latte – How are you, Nora? – and she is ready to keep on answering my questions on tv, music, cinema, and something more personal about her. In case you missed the first part of the interview with this strong, yet lovely woman, you can find it here. Let’s start. Are you ready? ☕ Yes? Go. ▷ Death Cab for Cutie’s I Will Follow You Into The Dark. ▷ Eternal Sunshine of the Spotless Mind. ▷ Robert De Niro and Jessica Lange. ▷ I do— María Moliner. For those who have never heard of her, she was born in 1900 and was one of the first female university graduates in Spain pursuing a profession. She set up several rural libraries to disseminate culture and literacy. After the Spanish Civil War, María, mother of four children, found the time to nurture her passion for words— Around 1950, she began writing the comprehensive ‘Diccionario de uso del español’ (Dictionary of Spanish Usage), which she completed in 1966. Her dictionary contains thorough definitions, synonyms, expressions, and families of words, and is much more detailed than the Royal Spanish Academy’s Dictionary of the Spanish Language. In 1974, María showed the first signs of Alzheimer’s disease and eventually died in January, 1981 in her home in Madrid. Oddly enough, a woman who had so much loved words ended up forgetting them all. ▷ Worry less, have more fun! Who’s Nora? ▷ Nora is an English-Spanish translator, expert back-translator, localizer, proofreader, quality manager, and linguistic validation consultant. She holds a B.A. in Translation with a Major in Law from the University of Buenos Aires, and has been in the translation industry for over 30 years now. Initially an in-house translator for the largest publicly-held bank in Argentina and a classroom-based and distance-education Teacher of English for International Trade, she became a freelance translator in 1992. Nora was Vice-President of FairTradeNet, a Geneva-based association of freelance translators and, as such, was part of the delegation representing FTN at the World Summit on the Information Society in December 2003. She became a certified life-sciences linguist in 2007 and is currently co-owner of Translartisan, a translation studio specializing in biomedical translation. You can find her on Facebook, Twitter, Pinterest, LinkedIn, or contact her through her website [translartisan.com].